The Wanderers Club, one of the finest clubs in Palm Beach County, hosted the historic 71st Women’s International Four-Ball for the sixth consecutive year! The ladies played on pristine course conditions resulting in red numbers at the top of the leaderboard. In the Championship Division, defending Champion Katie Miller and partner Lauren Greenlief posted the tournament low score in round two to capture the win by five strokes. After round one, Tara Joy-Connelly and partner Ina Kim took the early lead by one stroke with a three under-par 69. Joy-Connelly, of North Palm Beach, was fighting for a win after finishing in second place last year. One stroke behind heading into the final round was the team of Lisa Schlesinger and Andrea Kraus. Three teams tied for third place in red numbers with a round one 71 including Katie Miller/Lauren Greenlief, Sarah Matin/Kim Keyer-Scott, and Alexandra Frazier/Marie Arnoux. Miller, of Jeannette, PA, and Greenlief, of Ashburn, VA, started round two with a vengeance. Three birdies on the front nine confidently carried the duo into the final nine holes. Miller birdied holes 11, 13, and 14 while Greenlief birdied 12 and 17 to finish eight under-par 64. A strong finish sealed the victory at nine under-par 135, five strokes over the second place team of Tara Joy-Connelly and Ina Kim. 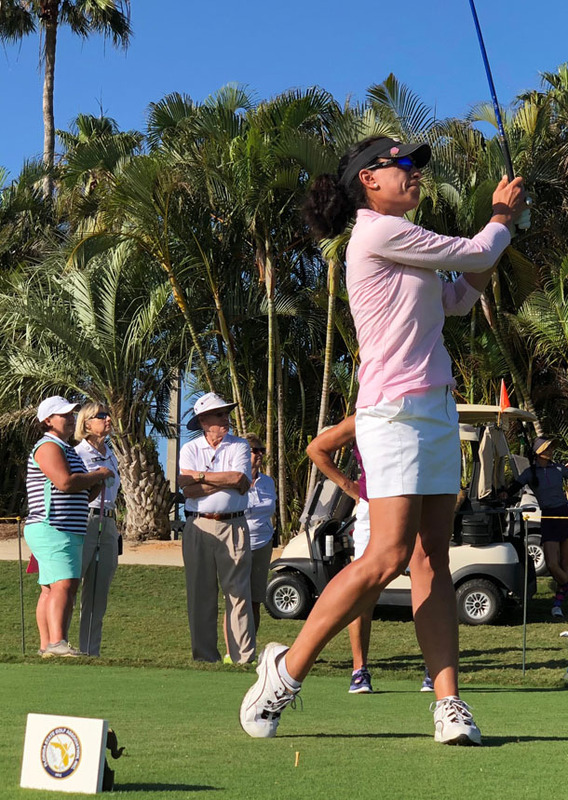 Joy-Connelly and Kim, of Jupiter, posted a second round 71 with three birdies and two bogies to finish with a four under-par total of 140. Sarah Matin, 2015 International Four-Ball Champion, rounded out the top three with partner Kim Keyer-Scott at 141 (-3). The Middle Division saw the team of Sandie St. Onge, of Stuart, and Kathi Lundstrom, of Sewalls Point, break through to finish in first. After round one, three teams tied for first with a one over-par 73 including St. Onge/Lundstrom, Karen Hale/AnnFulginiti, and Sis Hedges/Debbie MookSang. A second round 74 sealed a two stroke win for St. Onge and Lundstrom. Karen Hale and partner Ann Fulginiti took second place at 149 (+5). Partners Diane Carter and Mary Bruno went wire-to-wire to win first place in the Middle First Flight. The duo posted scores of 75-78 to win by three strokes with a 153 total. Second place was won by the team of Wendy Bingham and Tinker Sanger with two consistent rounds of 78 for a 156 total. In the Net division, at 12 under-par, the team from Wellington, Debbie O’Brien and Hanneke Vandenboomen finished in first place. Three strokes back, in second place finished Sarah Cohn and Kathy Baker at nine under-par 135. Forty-eight teams represented by 11 states and Canada made up the 2018 Women’s International Four-Ball field. This historic event, first conducted by the Jaycees of Hollywood, Florida, has comprised the names of golf’s finest—Babe Zaharias, Louise Suggs, Peggy Kirk-Bell, Marlene Streit and others. Katie Miller can be added to the list of esteemed names for the third consecutive time with partner Lauren Greenlief being added for her first time. Please join us for the 71st Women's International Four-Ball to be conducted at The Wanderer's Club in Wellington, Florida. This historic championship is being held at one of the finest clubs in Palm Beach County and is the last stop on the Orange Blossom Tour. The Orange Blossom Tour consists of the Harder Hall, SALLY and Ione. Jones/Doherty. The Wanderer's Club is maintained in exceptional condition and is excited to host this Championship. For a look at the 2017 Championship Results click here. Entry fee includes all competitive rounds of golf, tee gift, Monday evening cocktail reception with heavy hor d'oeuvres (cash bar), breakfast before and lunch after both Tuesday and Wednesday's rounds, and gift certificate prizes. Late entries will be accepted subject to a $10 late entry fee should the team gain acceptance into the field. To enter, both you and your partner will need to have created a free, online account at this website. Once both of you have accounts, you will be able to select your partner and submit an entry. If you and your partner already have an account, you will not need to create another account. The Championship Division is gross only and will not be flighted. The Middle Division will be pre-flighted based on combined team handicaps. Generally, divisions of more than 12 teams will be pre-flighted. Flights will be based on the number of teams and the range of combined team handicaps. Championship Division - The overall Champion will be the team with the lowest total score. In the event of a tie for first place, there will be a hole-by-hole sudden death playoff on a hole designated by the Committee to determine the Champions. Middle Division – Ties for first place gross and first place net in each flight of the Middle Division will be broken by a modified FSGA tie break method. The final day 18 hole respective score, whether gross or net, will be used to determine the first place gross or net team. (If there is still a tie, the final 9 holes of the last day (holes #10-18) will be used to determine the winner. If there is still a tie, the final 6 holes are used (holes #13-18); then if needed the final 3 holes (holes #16-18); then the final hole (hole #18); then by coin flip). Middle Division will pay gross first, then net. The valid USGA Handicap Indexes used will be from the February 1, 2018 revision. Each player must have a valid USGA Handicap Index no higher than 18.0 at time of entry. However, all teams must have a combined team handicap of 14.0 or less at time of entry in order to gain entrance into the field in the Championship Division. Teams must choose which division they wish to compete in upon entry; the Championship or Middle Division. Practice rounds are available on the Monday prior to the Championship (1:00 PM shotgun). Additional practice rounds may be available during the week prior to the Championship on a case-by-case basis, but there is no guarantee. The price for a practice round is $35.00 + tax. Even though the practice round is a shotgun, all players must call 561-795-3510 to register and reserve a spot. The proper place to practice your golf swing is on the driving range, hitting multiple shots on the course is unacceptable. Charlotte Daughan and Katie Miller won for a second consecutive year with an impressive 133 (-11) total. The duo jumped into the lead with a first round 65 (-7). They continued their strong start with birdies on holes 5, 8, 11, 13, and 16 to go 35-33 for a final round 68 to claim the title. 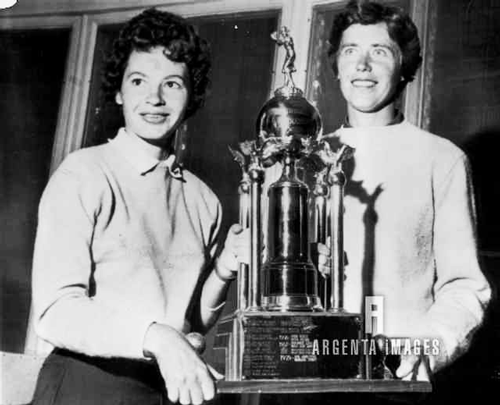 This marked Daughan’s third consecutive Women’s International Four-Ball win and Miller’s second. As the fourth championship in the Orange Blossom Tour that includes the Harder Hall Women's Invitational, the South Atlantic Amateur (SALLY), and the Ione D. Jones/Doherty Championship, the Women’s International Four-Ball carries a tremendous amount of history and prestige. First conducted in 1945 by the Jaycees of Hollywood, Florida, the early championships included the names of Babe Zaharias, Louise Suggs, Peggy Kirk-Bell, and other notables. The Wanderers Club is a challenging and unique Jacobsen Hardy design that is located in Palm Beach, North America's premiere equestrian community. It's immaculate fairways and greens, spectacular practice facilities, and high-end club ambiance provide the avid golfer the atmosphere they desire. The club is just minutes from the gorgeous and flourishing city of West Palm Beach where fine dining, shopping, and entertainment can easily be found. Please click here to learn more about The Wanderers Club.